Jungle Red Writers: Edith Maxwell and all her aliases! HALLIE EPHRON: Edith Maxwell, aka Tace Baker (author of the Lauren Rousseau mysteries), projects a cheerful, calm presence to the world. But behind the scenes I imagine she’s a whirling dervish, expert multi-tasker since she’s now writing three mystery series and producing about three books a year! 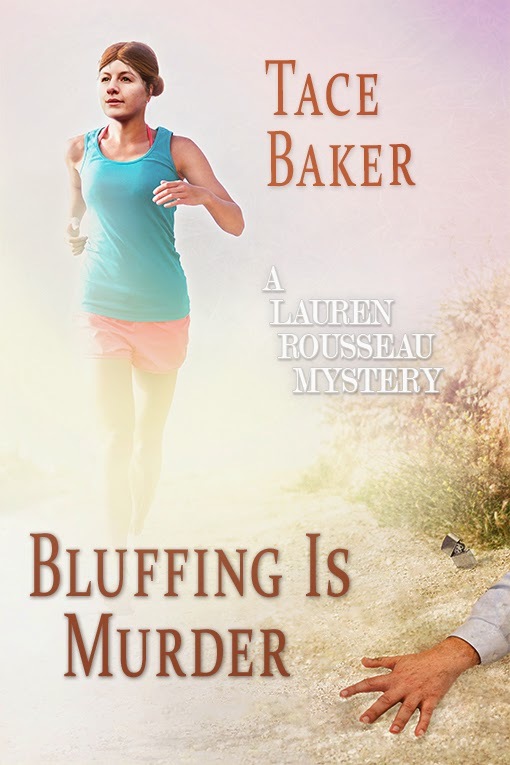 She’s here to talk about her new Lauren Rousseau mystery Bluffing is Murder, which she writes as Tace Baker. Okay, we know Lauren Rousseau isn’t you, Edith, but your character Lauren is a linguistics professor and you hold a doctorate in linguistics. So how does linguistics figure in your mysteries? EDITH MAXWELL/TACE BAKER: When I started the series, I thought Lauren would do more forensic linguistics, and she still might in her future. But so far it's more that she has a good ear for the languages she speaks and the ones she has had contact with -- Japanese, Bambara, Farsi, Russian, French, Portuguese -- and sometimes picks up identities of hidden speakers or otherwise solves pieces of the puzzle based on knowing the language. Linguistics is far broader and deeper than merely speaking languages, of course. In Bluffing is Murder, she thinks she's going to have her first quiet summer not teaching, since she finally landed tenure, but she's wrong. HALLIE: Another “coincidence” is that Lauren is a Quaker and so are you. How does that affect her character and the choices she can and can’t make? EDITH/TACE: Hey, write what you know! I've been a member of the Society of Friends for more than twenty-five years. When I started writing book one, Speaking of Murder, I thought a Quaker protagonist might be a good niche in the mystery field, and I was right. Lauren takes time for silence in her life and holding a person or situation in the Light, especially when things get tough. She has a strong sense of fairness and justice, but struggles with not finding peace or answers in Friends worship occasionally, as we all do. I've also written a Quaker protagonist into my 1888 historical mystery series, but that's another topic. HALLIE: And, got to ask, is there any resemblance between the coastal town of Ashford where Lauren lives and the town where Edith/Tace lives? EDITH/TACE: I wrote these two books when I lived in Ipswich, Massachusetts, and Ashford is only a very thinly disguised version of Ipswich, which is a beautiful town on the salt marshes north of Boston. Ipswich and Ashford both have their share of quirky characters and place names (my favorite walking route was going the length of Labor in Vain Road), but all the people in my books are fully fictional, unlike those apparently in the stories of a more famous previous resident of Ipswich, John Updike. What inspired you to write Bluffing and can you give us a hint about the significance of the title? EDITH/TACE: Well, until a couple of years ago, Ipswich had the country's oldest land trust, which was managed by the Feoffees of Little Neck. All rents and proceeds from the properties on Little Neck were to go to educate the children of the town, since 1660. Except the Feoffees were a secretive group not accountable to the public, and they hadn't paid the school district for the last decade or more. Feelings were high in town on both sides. It was a lot more complicated than that, but I thought the situation could have been fertile ground for murder. So I fictionalized the whole thing - and I was very careful to learn nothing about who the actual Feoffees were or what they looked like. I called the land trust The Bluffs and made the Feoffees into the Trustees of the Bluffs. One of whom, of course, is murdered. But bluffing also involves language, and doesn't every killer try to bluff his or her way out the crime? So the title works in several directions. HALLIE: And, for all the writers out there like me who struggle to put out a book every year (or two), what’s your secret?? EDITH/TACE: Since I quit my day job a year and a half ago, writing fiction is my new day job. I can't afford to be retired, and I want to get this new career off the ground. So I'm very serious about spending every morning either writing or revising, starting at seven, and the afternoons doing the business aspect: writing blog posts, arranging promotional events, and doing research. I fit lunch and my daily walk into the middle. I watch virtually no television and spend way too much time on Facebook, with reading saved for evenings and vacations. I have three books due next year, so I have to be serious about my writing. Panic is a great motivator! HALLIE: What's next for Edith and Tace? EDITH/TACE: I just turned in Flipped for Murder, the first Country Store mystery (which will appear under the name Maddie Day) two months early and am back in the middle of Compost Mortem, the fourth Local Foods Mystery. The third book in that series, Farmed and Dangerous, releases in May, 2015. I'm living my dream and, despite all the work, I love it. HALLIE: You know, I'm living my dream, too. It's a good thing to be reminded of every once in a while. Today Edith is giving away a copy of Bluffing is Murder to a lucky commenter, so please weigh in: What's your dream, seriously. Are you on your way, are already there? Congratulations, Edith . . . it certainly sounds like dream come true time for you. Aside from the obvious, what do you find to be the most difficult thing about writing three separate series? Thanks, Joan. Two (well, three) of my series are written in first person, but the Local Foods mysteries are in close third. This fall when I switched back to writing COMPOST MORTEM, I started every scene in first person and then caught myself halfway down the page and had to go back and change it. Also, my protagonists are all different, so I have to keep thinking, "Robbie would do that, but Cam never would" to keep them straight. In your own mind, do you assume a separate persona when you write as Tace from when you are writing as yourself? Do you have to mentally prepare yourself or get into Tace Mode before you begin writing Lauren's stories? Congratulations, Edith! THREE different series — hats off! Thanks, Susan! They definitely keep me busy. Laughing! So glad to hear this hasn't caused you to develop a split personality! So interesting about narrative voice... it's like you're putting on a different hat with each series. Do you write one series at a time or do you go back and forth between books? I'm so happy for all of your success Edith! Edith, after seeing your energy first hand on various committees I’m not surprised that you can pull off writing three series at one time. You’re an inspiration. Hallie, it's definitely putting on a different hat. Thanks so very much for the great interview questions. Sherry, sometimes I change hats midday! For example, I might be writing new material in the morning but have edits due on a different series, so I'll work on those in the afternoon. By preference I stick to one story at a time, though. Too confusing otherwise. Yay, Edith! What is a feoffee? Hope that day comes soon for you, Mary! Hank, a feoffee (pronounced FEF-fee)is basically a trustee, but it's an archaic term, and the Ipswich Feoffees were the last remaining in the US. William Paine created the land trust on Little Neck in 1660, thus the archaic useage. From Wikipedia: "A feoffee is a trustee who holds a fief (or "fee"), that is to say an estate in land, for the use of a beneficial owner. The term is more fully stated as a feoffee to uses of the beneficial owner. The use of such trustees developed towards the end of the era of feudalism in the middle ages and became obsolete with the formal ending of that social and economic system in 1660." Just wondering, how many hours a day to your write? Do you allocate specific times of days to the different books? My head hurts just thinking about it! Like Hallie, I do a book a year. But I have an idea for another series... So if you do have any advice, I'd love to hear it! Susan, I write every morning if it's new material, or edit/revise/polish if I'm in that stage, usually from seven to late morning. That's about all the creativity I have in me, unless I'm on a solo retreat. On retreat I write morning, afternoon, and night. I immerse myself deep and just keep going! I try to work on only one series at a time. If I'm in the middle of a first draft and copyedits come in on a different book, I lay aside the first draft and go full time on the edits until they are done. That helps keep the stories straight. So far this approach has worked for me. Congrats, Edith! Looking forward to reading your books no matter what name they are under. My dream? Finding a job where I am paid to read what I want all day. Somehow, I don't think that job exists, but I keep dreaming. Congratulations, Edith! Your books have wonderful characters in rich locations. The stories are enjoyable and addictive, so I'm selfishly glad you have lots of opportunity to write! I'm amazed you are able to accomplish as much as you do and still have time for family, friends, promotions, writer conferences, and more! Kudos to you! Edith, you are a wonder! I dream of writing ONE work of fiction, let alone several series. Looking forward to reading all you've been working on. Hi Edith! Lovely to see you here, and I'm so happy I got to meet you in Newburyport. You are indeed a whirlwind. If I counted correctly that's FOUR different series! I was going to ask what a feoffee was but see Hank beat me to it. Fascinating. As is having a linguist for a protagonist. Can't wait to read the book! How delightful to have a character who is a Quaker. That is a great influence to offer our society. Seems as though you deserve an award from the American Jugglers Association for keeping so many balls in the air at once. As for a dream -- I suppose I would like to do something more rewarding than corporate triage for a living. Possibly I'll put a little inspirational note up on my monitor: "Right now Edith is writing." Thanks for the literary escapes and the inspiration. I am certainly going to put your books on my list. A Quaker/linguist protagonist sounds fascinating. Good luck with your many hats! It was so lovely meeting you at Crime Bake and I just downloaded your latest novel - and am loving it! Do you have any advice for someone new to writing ? Thanks all! Am in Boston taking a friend to doc appt so will reply in full later. Does having three casts of characters keep you fresh and on top of your game, versus grinding out more books using the same setting and cast of characters? I've thought about it today, and it makes sense, though I'm a total immersion writer, deep in one setting and cast of characters. I frequently have trouble "emerging" at dinner time for a here and now conversation. Edith, like everyone else here, I am in awe of your output and happy for your success! 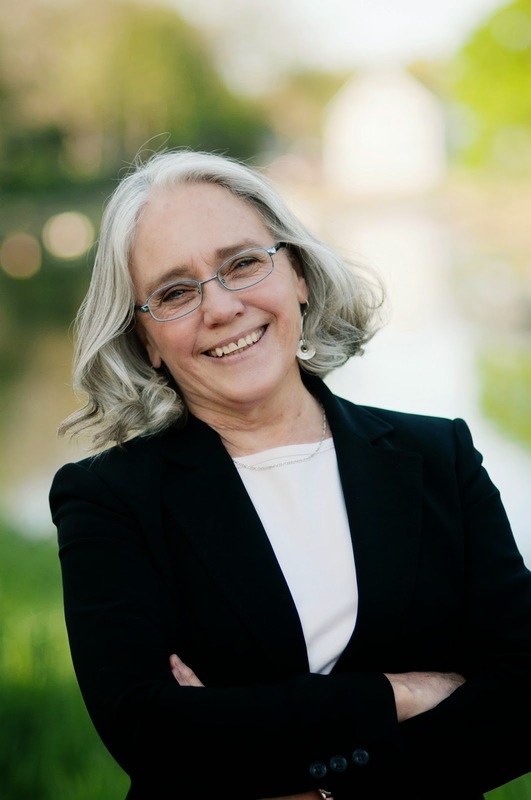 Keep those books coming--I will be on the look out for Lauren, especially, as I love linguistics and find a Quaker character (who is not a minister in a small town in Indiana) to be appealing. You mention attending conferences, but I am wondering if you have a local writer's group or circle of readers who provide feedback on stories in progress before they go off to the agent/editors? I love hearing the back stories of how an author comes to write a book, and the one for Bluffing is Murder is so interesting. So glad Hank asked what a feoffee is, though. I really enjoyed my linguistic classes in my undergraduate English degree, so I'm thrilled to find this series with the linguistics professor as the main character. I've always been fascinated with Quakers, too, so I know I've hit upon a great series. Again, the back story of your connections to this character make it especially intriguing. And, the clever use of the word "bluff" doesn't surprise me with your wordy background. I'm a big fan of play-on-words. It's so great that you get to concentrate solely on writing now, Edith. Three series? Wow! You are a dynamo. I still intend to dip into the Local Foods mysteries, too. So, I now know to look out for Edith, Tace, and Maddie. So happy that you're living your dream. Wonderful interview, Hallie and Edith! Karen in Ohio - you can do it. Debs - uh, yes, it is four, if all goes well. But three is fine. I'm just channeling my good friend Sheila Connolly! Libby - glad you like the thought of a Friend as sleuth. RuthB - thanks. Do you have connections with the AJA? ;^) And you're welcome to use me as inspiration (as long as you don't have a secret camera in my office watching me slack off and cruise facebook when I'm supposed to be writing). Bev - thanks, and good luck to your husband. He definitely should include providing dinner to his daily to-do list! Margaret - Keeping three series current either keeps me on top of my game or totally bewilders me! I know that feeling of deep immersion, though. "What did you say?" at dinner when I'm still surrounded by my story. FChurch - I'm in an excellent Monday night writers' group where I read scenes and get insightful critique, and give same back to others (at least I hope mine is insightful). And thanks for your kind words. Thanks, Kathy Reel. Hope you enjoy the books! Barb - Agree! Hallie asked some great questions. Hi Edith - how does your past career influence your writing and your writing discipline? I admire your courage! Storytelling friends who have left day jobs to tell full-time have referred to the fear of leaping into the uncertainties of free-lance work. I stayed in teaching (my dream job since the first day of kindergarten) and told to my students and occasional outside engagements . . . now retired and learning to enjoy my new status as "human being" rather than "human doing." It was harder than I thought to adjust to less to do, but then I remembered the joy of summers filled with reading and realized I'll never run out of books. I teach two tai chi classes a week, tell stories at a monthly story swap at the library and occasional paid events. Life is good, and your books are part of that goodness. Thanks!